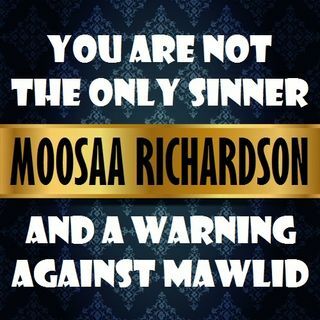 Moosaa Richardson explains the reality of every Muslim's sinfulness. It is not absolute innocence that can be attained, but rather successful management of sins and recovery from them, which requires community support. In the second khutbah, he reminds us of the need to avoid imitating the Christians and those who wish for religiosity without grounded authentic knowledge, like those who promote the baseless Mowlid celebration. This Friday khutbah (sermon) was delivered at al-Masjid ... See More al-Awwal in Pittsburgh, Pennsylvania (USA) on 1439.03.13.